The last two letters were inscribed and then, with a festive procession, Hadassah celebrated the donation by Isaac Zaoui of two new Torah scrolls to the Sarah Wetsman Davidson Hospital Tower’s Moshe Saba Masri Synagogue. 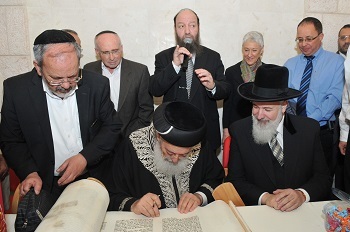 Participating in the celebration were the two Chief Rabbis of Israel–Rabbi Yonah Metzger and Rabbi Shlomo Amar; Dr. Yuval Weiss, Hadassah Medical Center Acting Director General; Rabbi Moshe Klein, Chief Rabbi of the Medical Center; Rabbi Yaakov Shapiro, head of Yeshivat Merkaz Harav; and Hadassah National President Marcie Natan, along with hundreds of patients, visitors, and hospital personnel. 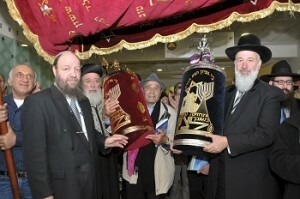 The procession paused by a sign recognizing Isaac Zaoui’s donation of the scrolls in memory of his wife, Jacqueline. Mrs. Natan presented Mr. Zaoui with a certificate, honoring his contribution. Later in the ceremony, a congratulatory message from the Saba family in Mexico was read. The synagogue bears the name of Moshe Saba Masri, who was tragically killed in an accident. 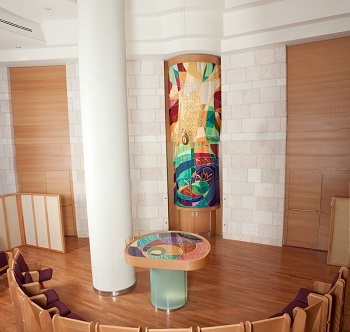 The Saba Synagogue, designed by Spector-Amisar Architects of Jerusalem, is a six-meter high, two-story sanctuary with 101 seats. Infused with light and a sense of space, the synagogue houses windows that overlook the landscape of the Judean Hills, imparting an aura of serenity. The décor of the interior includes carpeted floors, natural wood, and Jerusalem stone.